Gas Prices Rising Again? Here is a way to maximize fuel economy. We are living in difficult economic times and it feels like each week fuel prices are rising. Here is a tip you can use to help you gain the most miles from each gallon. 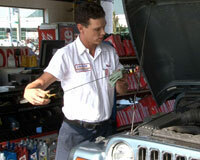 Regularly changing your oil will add many miles to your engine. Changing your engine oil according to your car manufacturer’s recommendation in your owner’s manual will help lubricate the engine, minimize friction and carry away excessive heat, all of which will lead to greater fuel efficiency. Clean motor oil not only protects your engine it can lower your exhaust emissions and allow your engine to operate more efficiently. A dirty or clogged air filter will result in lower fuel economy and increased engine wear. A dirty air filter can reduce your gas mileage up to 20%. Clogged or restricted fuel filters not only reduce engine performance but can allow dirt to contaminate the fuel system and cause engine wear. 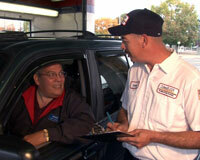 Most manufacturers recommend replacement every 3 years or 36 thousand miles. Clean fuel injectors perform better and make your engine more efficient causing gas mileage to increase. Malfunctioning pcv valves or dirty breather filters prohibit your engine from breathing properly and hinder engine performance causing gas mileage to decrease.